With heavy snow in the forecast for Sunday, we’re looking at pretty stellar photo opps on the trails. Since the roads leading to may be impassable, perhaps the upcoming events listed in the newsletter may be more accessible. Click on the cover to the right and see if one or all fit into your winter schedule. One young boy shouted this as he was on his way back from the farm animal sanctuary this morning. How could it not be the headline today? That young man was here with Charlene Finch and her Junior Gardeners from Continental. 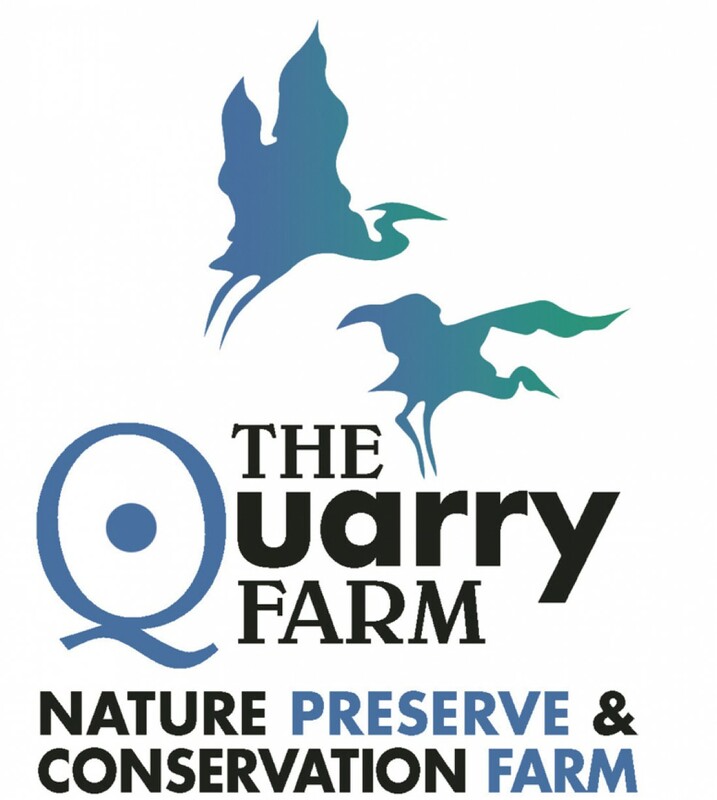 This was the second year that the group visited the Quarry Farm. They are one of best bunch of people we’ve ever met. Enthusiastic about everything, which is good since their day started here with rain. But since the shelter house went up last summer, the roof was ready and overhead. 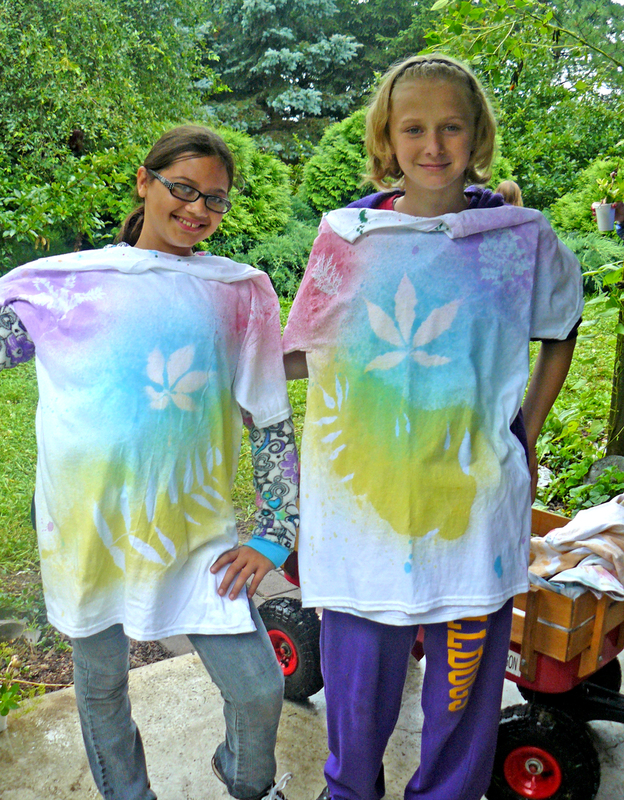 The new tent curtains were draw to the west and south, so the rain was hampered enough that kids and parents could make leaf shirts and select herbs for culinary, scent and healing bundles. first. Now the group receives donations, holds 50/50 raffles and sells food at the Continental fall festival to fund summer gardening projects. During the 2012 visit, Beatrice was just a piglet, a very shy one. Her encounter with Continental Junior Gardener Brandon was a positive turning point for us and Little Pig. Prior to the first trip, she wouldn’t let anyone close. But she liked Brandon. This morning as we all walked up the path to see the animals, Beatrice came at a trot, full grown and not a bit shy. Buddy and the goats were especially happy to see the 50-pound bag of peanuts that the group donated today. 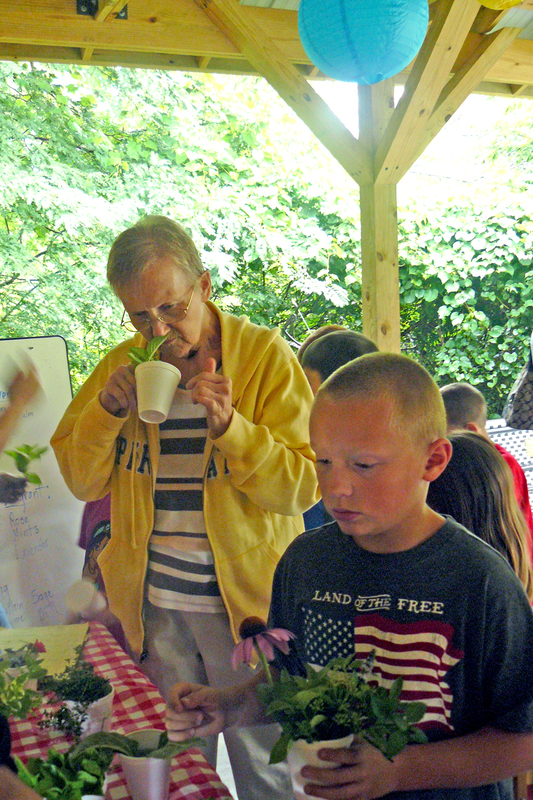 The Junior Master Gardeners of Continental (Ohio) graced The Quarry Farm with their presence on July 11, the first group to visit since the big wind blew through. Although there are still a couple of downed trees here and there, the paths were clear and mowed in time for the travelers to arrive. Led by Charlene Finch, the group of 20 adults and children of varying ages drove in around 10 a.m. to beat the afternoon heat. They divided into three groups to rotate through three different learning and activity stations. Group #1 met under the shady zelkova in front of Red Fox Cabin. 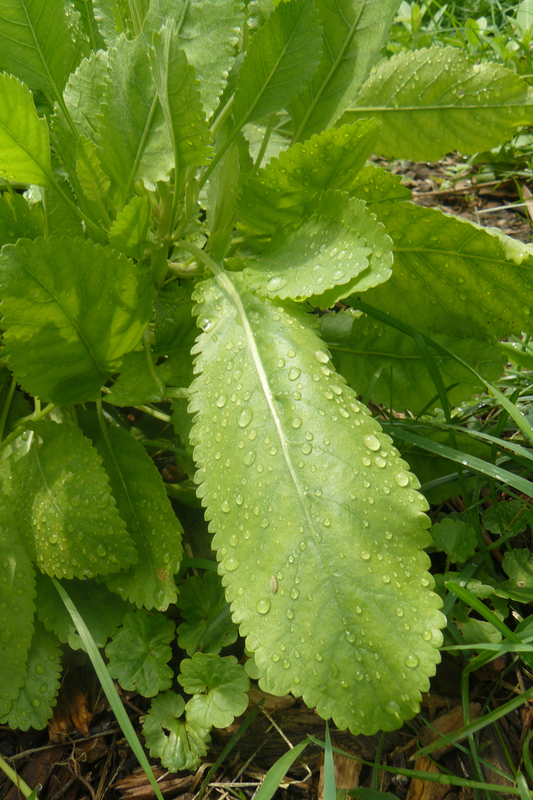 From Board President Laura they discovered the history of the cabin and the grounds, the gardens and made herb bundles from cuttings gathered there. Group #2 circled next to the ash stumps, recent victims of the invasive emerald ash borer. This was the perfect spot to hear Steve the Insect Guy talk about stream ecology, perfect because his roundtable included a meet-and-greet with riverine beneficial insects that grow up to combat harmful insects. Group #3 walked to the farm animal sanctuary where they were heartily welcomed by Buddy the miniature donkey. Despite the white-hot rising sun, Buddy held his post at the southwest corner of the paddock and brayed greetings to each group, keeping up the conversation throughout their stay at the station. One volunteer in each group was assigned to pet Buddy so that he would keep quiet long enough for Beatrice the pygmy pot-bellied pig to come out and meet the kids. This event was the first educational outing for Beatrice. She took a special shine to a gentle boy named Brandon, allowing him to feed her a piece of apple. Geese and chickens checked out the group from a distance, as did the goats. 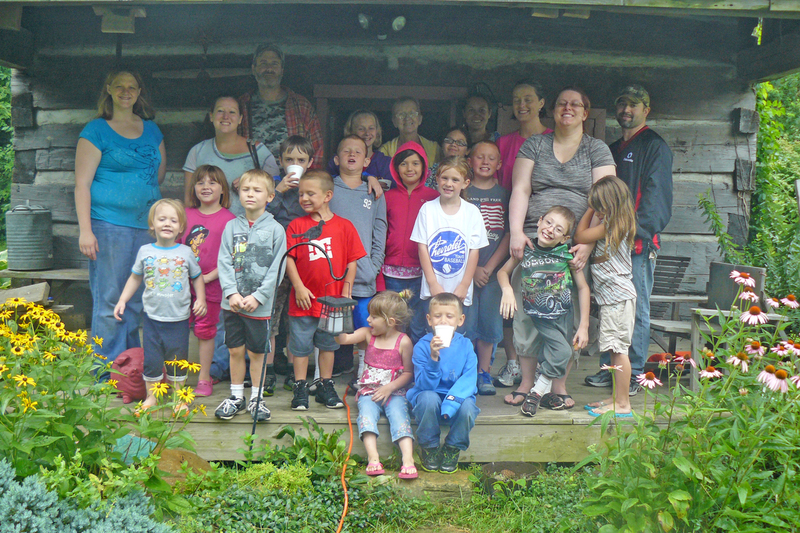 After all groups had rotated through the stations, everyone met at the cabin for cookies, lemonade, ice water and a group photo on the front porch. Some strolled through the gardens to see the blooms of drought-tolerant flowers and to scout for butterflies and dragonflies. Many thanks to Board Secretary Rita for photographically recording the event and for sharing them for this post.